I was recently assisting on a stage course alongside Patrick. We were lucky enough to be teaching a repeat guest. The guest is a solid diver, visits us a few times a year and wants to progress his education as a safe cave diver every time. Perfect. He goes away educated, trained and then gets the required hours of in water time to practice his newly found skills. He completed the course SM. The stage course is a minimum of 3 days depending on knowledge and skills in the water. Every forum, every agency, maybe even every diver has their own opinion on ‘the stage course’. I’ve heard some divers tell me “I’m not paying for someone to teach me how to dive a stage.” My current favourite quote is when people state “there is nothing to it, clip it on breathe half the gas, and clip it off to the line”. I try to explain it’s more than that but sometimes they don’t want to listen. The stage course is one of my favourite courses to teach and it’s high on my personal preferred ways to dive in the cave. We all as cave divers remember the importance of progressive penetration and of correct gas planning, right? For those cave divers amongst us that dive a lot and are always turning the dive on gas (when we just want to see what’s around the next bend or next tunnel), well the stage course is for you. We are all self-proclaimed diving geeks (you know you are!). We love to set up our gear, place bungee loops here and there, pull out our wet notes and plan our next dive. Well, we do all that and more on the course. You will learn how to correctly use a stage rig and most importantly how to set up your SM harness – if it’s not set up properly, the cave will teach you a lesson. You will learn how to correctly, safely and effectively communicate as a team during dropping and retrieval procedures and most importantly location on the cave line. We cover finning techniques, as with a 3rd tank things get a bit tricky. We also cover touch contact in zero visibility picking up procedures. Again, these skills are lifesaving, game-changing skills. Once the classroom presentations are finished, we head off to the ‘house of pain’ or Cenote Ponderosa for some confined water torture … whoops, skills! We set up, gear up and are in the water. Today’s skills will be those that we learned in the classroom – so trying to hover motionless and doing finning techniques is ok, except it’s a little tricky in 2m of water in a dry suit with 3 full tanks…well, tricky for everyone bar Patrick! So three hours of skills, drills and dropping/retrieving tanks with visibility and zero visibility pass by very quickly. It’s always good to go back to basics, especially if divers have not practiced these skills for a long time. As per normal on any ProTec course, we utilise our skill sets and past courses to continually evolve and set new bars for upcoming students from what we learnt on previous courses. So we now have free coffee to keep everyone sharp in the classroom the morning after the long day before – there’s nothing like air-con and a hot coffee to wake you up! So we begin day two with some theory on gas/dive planning to include the extended progressive penetration grid. “What’s new?” I hear you say. This will go along side your in-depth gas planning procedures. We will mathematically show you the pros and cons of stage diving. You will cover many types of ‘gas rules’ and how to choose and apply them to stage diving. We discuss communication procedures, team, global and personal awareness. We then plan a dive to put this all into practice. So we pack up and head back to the ‘house of pain’. 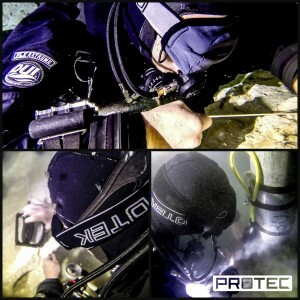 We carry out a full dive briefing, descend, carry out our S Drills and begin the guests first stage cave dive…primary, secondary connection into the main line is all exactly the same. It goes well. We swim down the cavern line at Ponderosa, looking for the “jump”. Team positioning, awareness is all exactly the same. We arrive at our “jump” – we are jumping left. The guest could not have done it better, perfect position and signals. We tie into the cave line. We swim in total for about 35mins before I signal to the leader to drop the stage. The guest is given multiple failures and free flows with and without visibility. It goes to show, if you receive the correct training, you can overcome any failures. There was as usual a lot to discuss on the debrief, after all we did an awesome 3 hour cave dive to the chapel and back from Ponderosa. If you have not seen this part of the cave yet, I would highly recommend it. This was the guest’s words over coffee that morning ha ha. So today was exactly the same as day two and we planned a dive at cenote Taj Ma Ha, followed the same procedure setting up, in water brief, S Drills and off we went. We have all dived ‘Taj’ right – but super shallow, in a dry suit with 3 tanks is a little ‘challenging’ as we all know. We tie in, make a good secondary and off we go, down the slope. We tie into the main line in ‘pole position’. We swim along the main line until our designated jump. We reach our stage pressure and we drop. Remembering his training, the team selects the correct place to drop the stage and the team form up using the line as a reference. The gas switch procedure is followed to the letter and off we go for the rest of the dive. Needless to say it was another 3 hours of fun! Small passages, big passages, white cave and dark cave. We practised Zero visibility, free flows and 1st and 2nd stage issues. It was awesome. What was not awesome was my mask breaking 30mins into the dive (yes I know, 1 in a million eh) – the strap broke so I referenced the line, alerted my buddy, closed my eyes and felt for my rear pocket and replaced my mask. All good you’re thinking right?……nope! I forgot to prepare my mask before the dive so every second it fogged up (that’s what it felt like) it was awful, plus all the skills and drills. I longed for the blackout mask that day ha ha. Again, we had an in-depth brief on the surface, calculated all our information from the extended progressive penetration grid and figured out that we actually have a good gas consumption, so we survived todays dive, even with a fogged up mask. For me, to teach this course or to be a student on this course means the same thing. Going back to basics learning, really learning the skills we all learned on the cave course and then just taking it to the next level. The stage course is more than just ‘taking a 3rd tank, and clipping it to the line’. 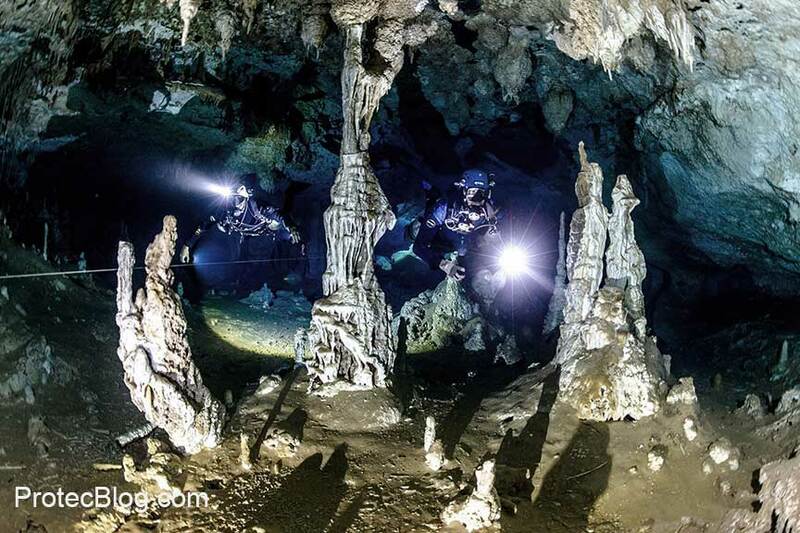 Cave diving is inherently dangerous and diving beyond ones certification is dangerous right? Receiving not just training, but good solid training is the smartest thing of all. 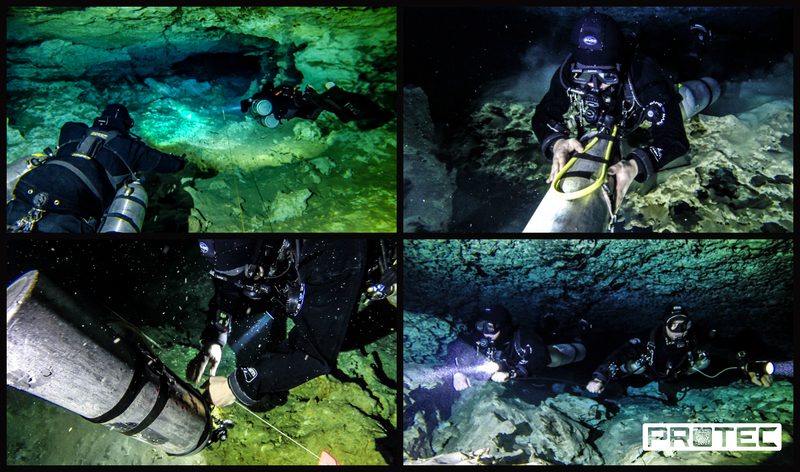 Once stage certified, your cave diving will be taken to the next level. Overall, 3 days and a total of 9 hours in the water – can’t be bad eh!! Last week I was down in Tulum to teach a Multistage course to Henric and Markus from Sweden. The two had just finished up their tec cave course with Kim and so came optimal prepared to the course. This also gave us the oportunety to mix things up a little and do some deeper longer dives involving decompression . We chose mainly Naharon, Mayan Blue and Regina to train. Like always though we started off with some theory and a confined water session. Main topics where team positioning during the switching and decompression, staging procedure and protoclol, emergency procedures with picking up and switching in zero visibility combined with gas sharing, and percental decompression calculations for given gasses and depths. And also technique how to handle more then two stages. For me the highlight were definitly the two last big 2 hour plus dives in Mayan Blue towards Nahron and the last dive in Regina down to the 100ft/30mtr level. On both dives we used 32% EAN as backgas and in two 80CUF/12ltr stages as well as a 40CUF/5.5ltr tank with oxygen at the entrance. The two had to deal with out of gas emergencies, zero visibility, burst disc and regulator failures, light failures only to name a few. Both where very focused and had a very positive attitude and definitly enjoyed the dives we did. We started off exploring in Cenote Lycka and managed to squeeze in a couple hundred feet of line, resurveyed some import parts and where continuing to look for leads that would bring us further south. A great day and perfect start for a week of exploration. The next day we went to recent rediscovered cenote ek be where we had spent hours the week before to clean a path that would facilitate equipment transportation. In the following days the team was lucky enough to find a lot of going cave and add more then 6600feet/2km of new lines to the system. Nothing better then to be out there in the jungle doing what you love most while spending quality time with great friends and seeing their faces when they surface with two empty reels!!! The coming weeks have a normoxic trimix class on the schedule, advanced sidemount and a advanced nitrox instructor course … I am psyched!! !